Number 27 is the house shown in the centre of the photograph on the left. This photo was taken in the early 1960’s. Click on the thumbnail on the right below to see the view of the top end of the street. We are grateful to South Gloucestershire Council for allowing us to view the deeds of this property. Early records from the 1780’s show that the property was then owned by Richard Williams. He was a tiler and plasterer who appeared to own a large part of this area according to his will dated 1785. On Richard’s death his property was put in trust for the use of his wife, Mary. An abstract of title shows that the property passed from Richard William to Henry Wilkes on 24th and 25th April 1826. On Henry’s death the property was passed to his wife, Mary. Annie Lawrence – an agreement was made on 22nd June 1920 between George Mansell Williams and Annie Lawrence. Annie was a widow living at Oaklands, Newnham on Severn. At the time of the purchase, Annie was given the option to buy a strip of land including a coach-house at the rear of her property which belonged to George Mansell and his wife, Sarah following their deaths for £10. George died in 1922 and Sarah in 1936. By 1936, Annie was living at St John’s Vicarage, 12 Fitzroy Square, London and she took up the option of buying this land for £10 on 28th April 1936. The next day, on the 29th April 1936, she sold all the property including the coachhouse on Rock Street for £150 to Cyril Mark Williams. Cyril Mark Williams – at the time of their purchase of 27 St Mary Street on 29th April 1936 Cyril and his wife, Hilda, were living at The Pound, Oldbury. Cyril and Hilda lived in 27 St Mary Street until they moved to Selwood, 22 Gloucester Road about 1965/6. They continued to own 27 St Mary Street and let the house out to tenants. 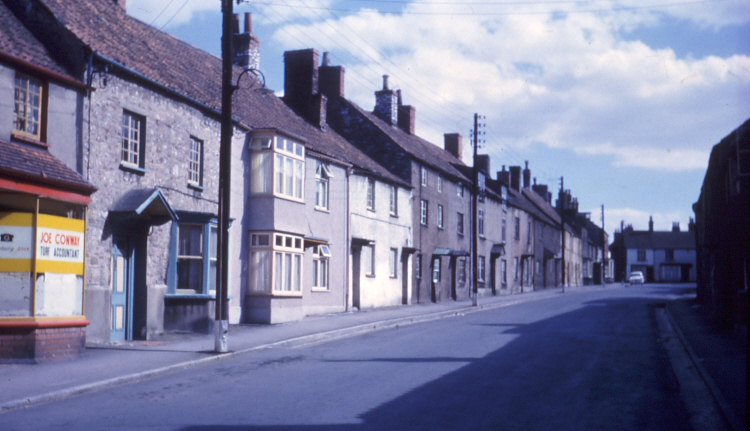 The house at 27 St Mary Street was acquired by the Council for the town centre re-development on 8th May 1969. They paid £850. It was demolished to make a pedestrian access to the library and behind the shops now forming 25 and 25A St Mary Street.